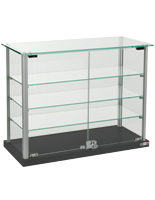 This glass cabinet, also known as a countertop showcase, holds expensive or fragile merchandise. Many different businesses find these wood showcases useful, including jewelers, souvenir, gift or collectors' shops, museums and more. 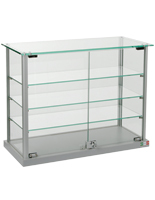 Is your business looking for a store counter glass cabinet? If so, you have come to the right place! These counter top fixtures are well-crafted and designed to last for years. 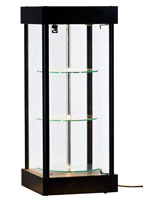 This glass cabinet has many great features that make it a smart choice for any commercial environment. As with any product offered here, this showcase selection are sold with quantity discounts, meaning the more that are purchased, the more money is saved! 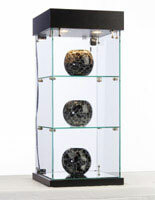 This small jewelry case, glass cabinet is sold in different styles including part of the EuroVū brand of showcases. These units are a beautiful and affordable choice! What features are offered with this glass cabinet that can be placed on a shop countertop? 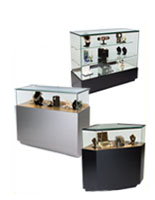 Tempered Glass - A safer alternative to traditional, annealed showcases. The glass cabinet is less likely to break but if it does, it will shatter into small, manageable pieces. This is also a smart alternative to acrylic, as they are more upscale and blend in nicely into a wider array of environments. MDF Construction - Medium-density fiberboard is an inexpensive alternative to a solid wood case for a retail sales area. Each glass cabinet has a veneer or laminate top and base providing the appearance of real wood without the hefty price tag. Hinged, Locking Door – This keeps objects safe from theft, damages, dust & more! 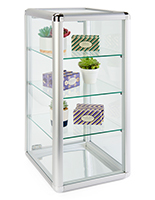 Each glass cabinet features a full-width door, not placing any restrictions on the size of merchandise that can fit through the door (versus into the actual unit). Halogen Top Lights - Two 20-watt halogen lights are recessed into the top canopy of the glass cabinets for a countertop. The lighting provides illumination upon displayed objects, adding extra appeal to each piece. A cord comes out of the top of the glass cabinet, with a rocker-style on/off switch for easy lighting changes. Mirror Deck - The bottom of most of these showcase displays are mirrored, offering an extra touch of class to all goods inside. It adds a shimmering touch, as well. This glass cabinet for a retail institution is just a small portion of the case styles available. The EuroVū brand is a very popular one on this site and offers some specific characteristics. In general, the glass cabinet is square or rectangular, but do not have extrusions which are generally present on glass cabinets of this shape. This is a big bonus because it offers customers a complete view of anything that is in the case. The Simplice line also includes a solid MDF (medium-density fiberboard) base and most models include a canopy with lighting, as well. Depending on the size of the glass cabinet, a certain number of fixed-height shelves are included. Other styles found under the EuroVū brand include the Originale Line and the Moderno Line. Both of these are a bit more upscale in appearance, with a curved design. There are also other styles available without lights as well as rotating units that are a bit more elegant. Some of the glass cabinets ship fully assembled while others are unassembled. The knock-down units are relatively simple to put together. Printed instructions are included with each glass cabinet and can be found on each individual product page. There is also a simple and straight-forward How-To video on each product page, showing the necessary steps to assemble the showcases for use on top of a store counter. The glass cabinet ships in two separate boxes. The first box holds the base and canopy, as well as hardware. The halogen lighting is already assembled into the canopy with all wiring completed; users simply need to plug in the unit and turn it on (after putting together the unit). The second box is clearly a small wooden crate that contains the side panels, door and shelves. Start-to-finish assembly should take about 10-20 minutes and is possible with just one person. What Colors Are Available For These Glass Cabinets? Cherry - Cherry is a popular selection for jewelry stores, as it often coordinates with the shop counters below. Many believe this is because both gold and silver look very nice against the rich, red color. The cherry laminate on the displays features wood grain to give the appearance of real cherry wood. Silver -Silver is another common choice as it often signifies elegance. It is a basic color with metallic specs that work well in many different environments. Black - Black is the go-to choice for many retailers. This color is versatile, either remaining neutral, or making a statement, as the environment requires. It provides a nice backdrop for displaying many products, making them really stand out. The black veneer has inlaid grain for an added touch. Many existing fixtures, like retail store counters are black, so this will match with existing fixtures. Maple - The maple finish is a neutral color that blends with any type of décor or styling. Many retailers and shop owners favor the natural look over the other darker choices typically offered among these small glass cabinets. These glass cabinets sit atop a retail counter, providing a centralized area to both house and showcase merchandise. Retailers often use these store fixtures to highlight certain special pieces from a collection. The item could be an expensive, fragile or one-of-a-kind piece that deserves special attention. It could also be a slow-selling item that has been sitting in a standard jewelry case for months, without being sold. Bringing the item up to eye-level and taking it out of its surroundings is often enough to have the piece attract the attention of a purchaser or consumer. These glass cabinets that sit on a countertop are often used to show sale merchandise to customers. As necessary, retailers will pull certain pieces out of larger showcase and place them in these counter top fixtures. In many instances the pieces in the small glass cabinet sell faster than if they were in a larger case. Buy these spinning cases, or stationary units before 3PM EST to qualify for same day shipping options. In addition to these glass cabinets, there are many more styles available. Most cabinets and shop countertop cases available here are coded with a numbered system to help customers find displays that coordinate together. Some of the styles available for displayed objects include the California Line, Howard Miller curio cabinets, Grace Tyler upscale fixtures, and the Essentials Line of counters. Each line has its own unique features and attributes making them different from the others. Customers are encouraged to shop the many different styles available here to find the perfect store counter showcase for their needs. In addition to the fixtures, Displays2go sells a wide variety of point of purchase displays, including poster frames, stanchions, dump bins, event tents, TV stands, brackets & mounts, picture frames, sign holders, restaurant supplies and much, much more! These retail counter displays are built with style and functionality in mind. The Simplice line is a basic choice, offering traditional styling that is versatile enough for many different locations. These showcases (ship unassembled) that sit on a retail counter top hold displayed goods. These wood and glass showcases include a hinged, locking door, making them a smart choice for retailers. An alternative to these well-crafted jewelry fixtures is small acrylic countertop jewelry cases. There are several options available for customers that may need a question answered. Customer service experts are available Monday through Friday from 9am to 5pm. A CSR can be contacted in one of three ways: via the telephone at 1-800-572-2194 , via email at info@displays2go.com, or using the convenient Live Chat feature. Live Chat allows customers to ask questions without having to pick up the phone, or send an email and wait for a response. Shop Displays2go today for all of your company's POP fixture needs!